This is another of Herr's traditional pack designs, which usually work. However, the cartoon drawing of the salt shaker on a yellow background, on a brown packet, is quite frankly, odd. 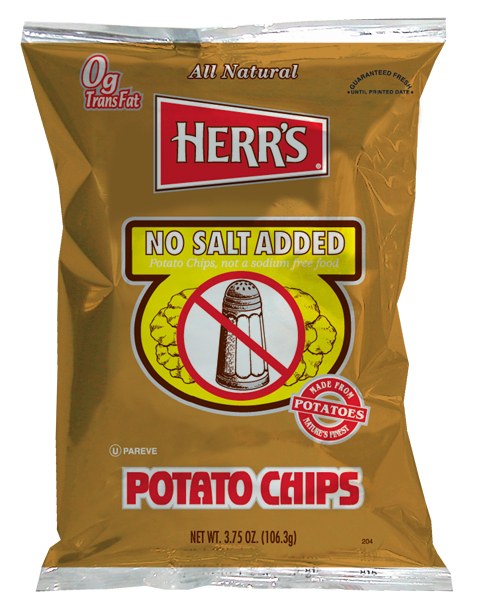 It seems somewhat strange that a large company like Herr's would employ such a bag design for marketing purposes. It is hard to see what a customer would find enticing about this one. Again, as this is much the same Chip, this is the same write up as the Crisp 'n Tasty review: You will find a light and crumbly crunch which can turn a handful into a crackling mouthful of mushy potato pretty quickly. What follows is exactly what we wrote for the Crisp 'n Tasty version: A standard, no frills, basic and simple, Chip. A standard thickness upon which any could be designed. There are some blemishes and natural colors. Little in the way of seasoning, and while greasy, they did not seem as greasy as the Lightly Salted or Crisp 'n Tasty versions. The 10mg of salt must be from the potato. And you do get a hit of potato but that is drawn out by the copious amount of fat involved. Unless you have a very tasteful sandwich to accompany these Chips it is hard to know where such a bland snack food would fit into a 'Chip buying possibilities' list.